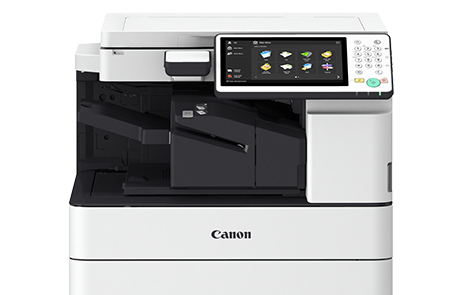 The Canon IR-C5535 is a great addition to any workplace looking to streamline its workflow and printer needs. This machine is a real all-rounder with the capability not just to print, but also to scan and copy and with the option of a fax functionality as well. It has a 6,350 sheet capacity making it ideal for any busy workplace and can also provide professional level publishing and finishing services in-house. The Canon IR-C5535 measures roughly 950 x 620 x 742mm and weighs approximately 142kg including toner, so clearly this isn’t a machine for smaller offices. It comes in a predominately white finish with a 10.1-inch colour touch screen that works in much the same way as a smartphone or tablet and is very easy to use. It has a high capacity cassette feeding unit which supports A4, as well as a paper deck unit that can hold up to 2,700 sheets, and a copy tray and utility tray. One of the Canon IRC5535’s main advantages is its colour touch screen which is very easy to use, and means you can amend print demands, even while they are in the queue. It also has wireless capabilities, making it a great addition to the modern workplace. Documents can be printed straight from the cloud, or scanned straight to your mobile device, with blank pages automatically removed from any scanned in documents. One of the most important additions to this printer is that you can produce high quality, professional looking booklets automatically. There’s also a staple on demand function. The printer has print speeds of up to 35ppm and a print resolution of 600 dpi x 600 dpi. The price of the Canon IRC5535 means it is a major investment, and its size makes it inappropriate for smaller businesses or offices.